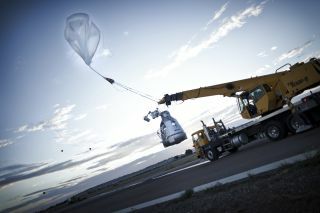 The crane follows the balloon with the capsule at the flight line during the second manned test flight for Red Bull Stratos in Roswell, New Mexico, USA on July 25, 2012. Red Bull Stratos is a mission to the edge of space to an altitude of 37.000 meters to break several records including the sound of speed in freefall. A daredevil leapt from a balloon more than 18 miles above the Earth today (July 25), moving one step closer to a so-called "space jump" that would set the record for the world's highest skydive. Austrian adventurer Felix Baumgartner stepped out of his custom-built capsule at an altitude of 96,640 feet (29,456 meters) above southeastern New Mexico, officials with Red Bull Stratos — the name of Baumgartner's mission — announced today. In today's jump, Baumgartner experienced freefall for three minutes and 48 seconds, reaching a top speed of 536 mph (863 kph), project officials said. Baumgartner then opened his parachute and glided to Earth safely about 10 minutes and 30 seconds after stepping into the void. Daredevil skydiver Felix Baumgartner steps into his high-altitude balloon capsule in Roswell, N.M., during the second manned test jump for the Red Bull Stratos mission on July 25, 2012. He's working up to this goal in stepwise fashion, having completed a jump from 71,581 feet (21,818 m) this past March. Before that, his highest-ever skydive was from 30,000 feet (9,144 m) up, team officials said. Today's successful leap came tantalizingly close to the current record for highest-altitude skydive, which stands at 102,800 feet (31,333 m). It was set in 1960 by U.S. Air Force Captain Joe Kittinger, who serves as an adviser for Baumgartner's Red Bull Stratos mission. The Austrian daredevil doesn't take his leaps lightly. "The pressure is huge, and we not only have to endure but excel," Baumgartner told ABC News before his jump. "We're excellently prepared, but it's never going to be a fun day. I'm risking my life, after all." Baumgartner's helium-filled balloon lifted off from Roswell, N.M. this morning and took about 90 minutes to reach the skydiver's jumping-off altitude, officials said. Baumgartner and his team had hoped to attempt his record jump in 2010, but they were delayed by a legal challenge that claimed the idea of the dive was earlier suggested to Red Bull by California promoter Daniel Hogan. That lawsuit has since been settled out of court, and the Red Bull Stratos mission is moving forward.